Joey Couden has been knocking on the door all summer but he had never been allowed to enter the final table. Having a few narrow misses, Couden's summer was decent but he kept falling just before the pay jumps started getting juicy. It wasn't the case in the Event #53: $1,500 Pot-Limit Omaha Hi-Lo 8 or Better, though. 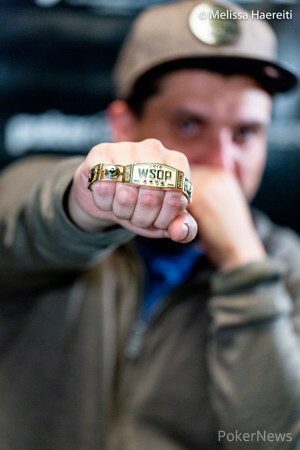 Couden came back for the final day second in chips with 20 players left and he was able to close it out, banking $244,370 and his first WSOP bracelet. "I felt pretty good all summer. Just wanted to stay focused. As long as I don't make any mistakes, I feel fine where I bust, it's variance," Couden said, knowing that the only way to break it led through a patient and precise grind. Today was his day. He won, quite literally, at the eleventh hour as the heads-up match against Bruno Fitoussi was about to halt for the day with only 2 minutes and 30 seconds left in the extra level. But Couden was able to finally deny his last opponent in a preflop all-in situation. He hit an ace on the flop to crack kings and then held through the remaining streets to have his name engraved among the greats, beating a field of 935 entries. What made Couden's first victory truly special was the company he had to prevail in. With decorated veterans such as Eli Elezra, Mike Matusow and Daniel Negreanu all making the final table, Couden may have been overlooked but he left all seasoned heroes behind. Couden had previously made two final tables for bracelets but battling some of the most iconic players in history is a unique experience. "It was just a lot of fun getting to hang out with Matusow, Eli and Bruno. They're such great personalities. I had a great time." Couden had the best imaginable start to the day. He busted another big stack Brad Albrinck in the first minutes when he flopped top two pair against top pair and both flush and low draws. The chips went in in a dramatic fashion but Couden made a full house on the turn to leave Albrinck stone dead. That clash catapulted Coulden to a massive lead with 1.3 million out of 7 million in play. "I checked, he bet, I potted it and he snap-jammed," Couden reconstructed what happened on the flop. While it was a tough situation with a lot on the line, he still pulled off a call after giving it only about 30 seconds. "It's a pretty big tank for me," Couden laughed. "A lot of people think that he'd have three kings there but I don't think he would snap-jam," he explained his thought-process during the hand. Since then, Couden never really had a tough time regarding his chip stack, sitting near the top or at least in the top half virtually until the very end. When the final 10 players took their seats on the final table, Couden was in fourth place. But he wasn't eyeing the title just yet, trying to focus on one hand at a time. "I tried to stop thinking like that years ago. You don't bust the tournament and lose the buy-in, you lose first place every time you play the tournament and bust," Couden explained. Negreanu was the shortest player, bringing only 19,000 to the table with the blinds at 10,000/20,000. The all-time winningest player went on a rush and scored several doubles to bounce back to almost 20 big blinds at one point, but he couldn't eventually squeeze out more than ninth-place finish, following the elimination of defending champion Nathan Gamble in 10th. They both fell to Elezra who was the most dominant player at the table, joining more pots than anybody. Elezra then extended his streak by busting Gregory Jamison in eighth. Meanwhile, Couden was still chilling with a solid stack. The only brief stint that saw him getting a little shorter was after a dinner break when he was down to 14 bigs for a moment. But he busted Dustin Pattinson in seventh and re-established his position. Couden, Fitoussi, Elezra and Matusow all held the lead at some point during four-handed play but Matusow lost a big pot in a flush-under flush contest against Couden and soon fell in fourth. Elezra had to settle for bronze and Couden and Fitoussi ended up competing for their respective first title. Couden had a huge lead, and while Fitoussi had a tough skin and doubled several times, he wasn't meant to turn it around. Couden never relinquished his lead and took home the bracelet. Crowned PLO8 champion, Couden said he will probably appear in the $10k Championship event that starts tomorrow to pursue a back-to-back-victory. Couden will surely stick to his gameplan which has proved successful: "Stay focused on one hand at a time." Bruno Fitoussi got all of his chips in the middle preflop and Joey Couden snap-called to put the bracelet on the line. Couden's rail chanted for an ace and they got their wish when the flop fanned out . Fitoussi was in trouble needing a king but it would not come as the board completed with the and Fitoussi came up just short, finishing runner-up for $150,990. Joey Couden is the champion of Event #53: $1,500 Pot-Limit Omaha Hi-Lo 8 or Better cashing for $244,370. Bruno Fitoussi raised to 360,000 on the button and Joey Couden raised the pot, putting Fitoussi all-in for an effective 860,000. Fitoussi called off and they were racing again. The flop came and Couden informed his railbirds about the situation: "Terrible board. We need a king." But the turn was the , leaving Couden drawing dead as Fitoussi had it locked with queens full. The landed on the river to make things official and Fitoussi doubled one more time. Bruno Fitoussi moved all in preflop for 490,000 and Joey Couden put him at risk. The board ran out with Fitoussi flopping a Broadway straight and another double was sent his way. In a limped pot, Joey Couden bet 200,000 in position on the turn and Bruno Fitoussi check-called. The river fell and Fitoussi let Couden fire another 500,000. He made a quick called and Couden turned up his in excitement. "Nuts!" Couden said. 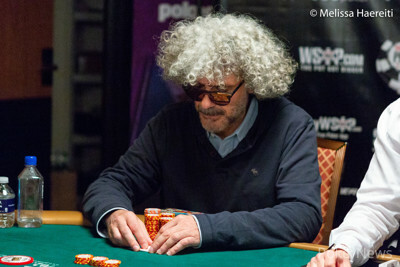 Fitoussi nodded and shipped Couden the required chunk. He was left with around six big blinds. Joey Couden made it 360,000 preflop and Bruno Fitoussi called. All the chips went in the middle on a flop with Fitoussi's tournament life on the line. The hit the turn meaning there would be no low and the completed the board. 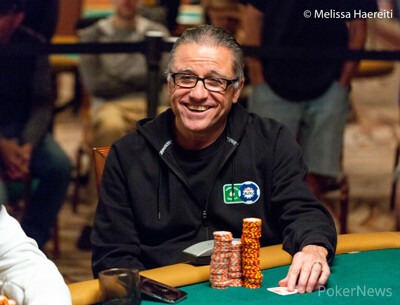 Fitoussi's all in totaled 835,000 and Couden matched it. Bruno Fitoussi managed to get some chips from Joey Couden since they came back from the break but Couden won a recent pot when he made it 250,000 on the button and Fitoussi defended. The flop ceased fire and Fitoussi checked the turn. Couden, however, fired the maximum this time, potting it for 500,000. Fitoussi gave it a brief thought and then mucked. Joey Couden raised to 250,000 and Bruno Fitoussi called in the big. They checked the flop and Fitoussi checked the turn again. Couden bet 175,000 and Fitoussi cut out a raise. He put in only 300,000 so he had to add two more red chips to make it 350,000 for a double raise. Couden called. The river was quickly checked and Fitoussi showed but Couden immediately rolled over for trips and took down the pot. That was the last hand of the 10th level of the day but the players used the option to play one extra level tonight. They took a 15-minute break and then come back to continue in level 60,000/120,000. All three players put in the minimum to see a flop. Joey Couden bet 100,000 getting rid of Bruno Fitoussi but Eli Elezra raised all in for about 700,000 more and Couden put him at risk. The board ran out and Couden scooped the pot with a wheel to send Elezra to the rail in third place. In a completed pot, Bruno Fitoussi and Eli Elezra put 200,000 in front of them on the flop. The rest went in the turn with Elezra holding for the bottom set and a flush draw. Fitoussi had without a flush draw, hoping to hit a five on the river. It was the instead and they chopped it. Eli Elezra opened to 375,000 on the button and Bruno Fitoussi called out of the big blind. The flop fanned out and Elezra bet 700,000. After a moment, Fitoussi check-folded. Joey Couden limped in from the button and called when Bruno Fitoussi made it 400,000 out of the small blind. The rest of their chips went in on the flop where Fitoussi potted for 900,000 and Couden shoved all in for effectively 255,000 more. Fitoussi called and found himself behind. Couden flopped top two pair but the turn brought a superior two pair for Fitoussi whose aces held up on the river. Couden sent 1.55 million Fitoussi's way and the French two-time WSOP runner-up took over the chip lead. Joey Couden opened to 200,000 on the button only to see Eli Elezra three-bet to 650,000 out of the big blind. Couden called and a flop was dealt. Elezra check-called a bet of 350,000 and the hit the turn. Both players checked and their final card on the board was the . Elezra checked and Couden bet the pot, enough to cover Elezra, and Elezra was forced to fold. Joey Couden limped on the button and Eli Elezra checked his options. They checked the as well and Elezra led out 200,000 on the turn. Couden called and the completed the board. Elezra fired 600,000 and Couden didn't waste much time before calling. They chopped the pot as Elezra made a six-low with three-deuce but his straight was no good against Couden's . After Joey Couden limped from the small blind, Bruno Fitoussi checked his option, and the two saw a flop. Couden check-called a bet of 200,000 and was delivered on the turn. Both players checked bringing the on the river and Couden took it down with a bet of 500,000. Eli Elezra raised the button to 200,000 and both of his opponents called to go three-way to the . Joey Couden and Bruno Fitoussi checked to Elezra who bet pot for 600,000. Couden folded right away but Fitoussi thought about his options for about a minute. Then he chose to muck his hand and Elezra scooped the pot to narrow the stacks. 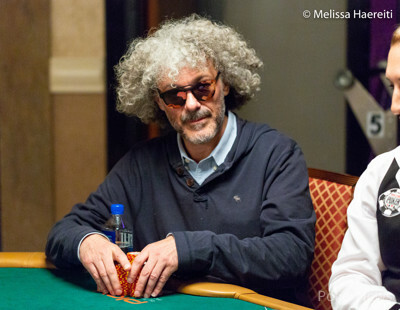 Bruno Fitoussi limped under the gun and Mike Matusow three-bet shoved for 230,000. Eli Elezra flatted but folded when Fitoussi four-bet pot. The board ran out and Fitoussi made the nuts on both sides. 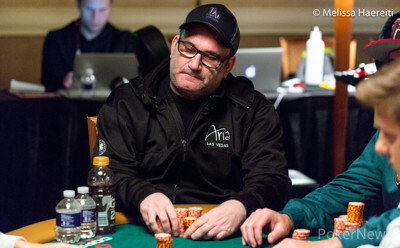 Matusow was eliminated in fourth place and received $75.708.